I'd like to label the edge between A and B as well as the one between E and F, using the same string for each label. I'm expecting the same output, except with longer A->B and E->F edges bearing the same label. I'm very new to graphviz and, following many questions on StackOverflow, I have been experimenting with different combinations of rank and constraint, I tried using clusters to see if it would keep the top and bottom part properly aligned independently, and tried using a mix of dot, ccomp, gvpack and neato that produced similar results. It always seems to boil down to the fact adding a label to the edge between nodes with the same rank affects how these nodes are positioned in a way I don't yet understand. Am I missing something trivial, or am I attempting something I shouldn't instead of letting dot do its thing? Not the answer you're looking for? Browse other questions tagged layout label graphviz dot edge or ask your own question. 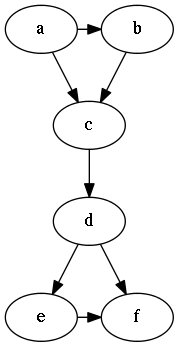 Graphviz: How to go from .dot to a graph? 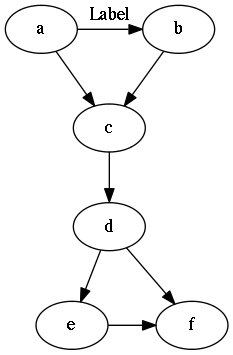 How to enforce the left-to-right node ordering in GraphViz rank layout?